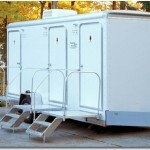 APT’s mobile shower trailers provide the privacy and comfort you deserve. 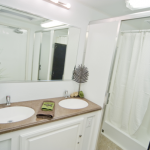 These clean, rugged use facilities feature individual shower rooms, private dressing rooms with seat, double sinks with hot and cold running water, heat and air conditioning. All that is required is 110v power and a garden hose. These units can be hooked directly to a sewer line for continuous use. If no sewer or water hook up is available, we can service units by emptying waste holding tank, and fill the on board 300 gallon water tank to provide a self contained shower unit.